I still fondly remember Yankee Pier, the first Santana Row sit-down restaurant. 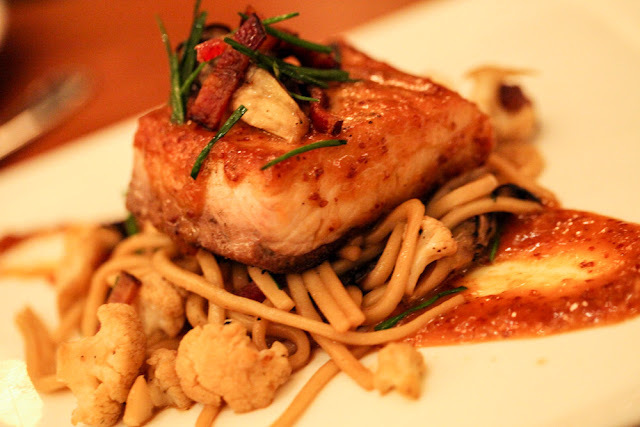 It ended up becoming the first of many in one of the South Bay's premier dining destinations. After several years, the space was remodeled and transformed into Lark Creek Blue, which was still heavily focused on seafood. Now in the third incarnation of this space, Lark Creek Kitchen opens up the menu dramatically and focuses on more creative and elaborate dishes. Executive chef Nick Tall previously worked at Amber, a Two Michelin Star restaurant in Hong Kong. You can definitely see the influences from both Amber and Nick's Miami upbringing in the dishes. 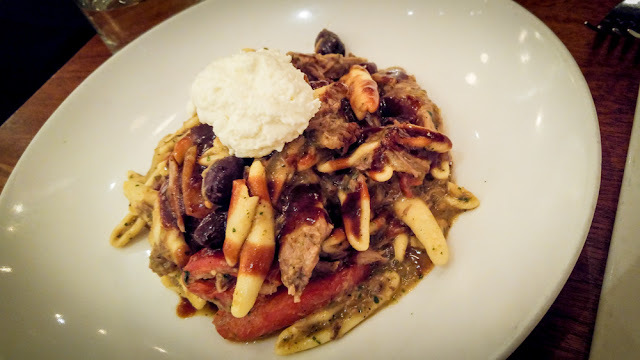 The menu also changes frequently with seasonal items being added every two weeks or so. The summary (if you don't want to get into all the specifics below) is that I loved it. 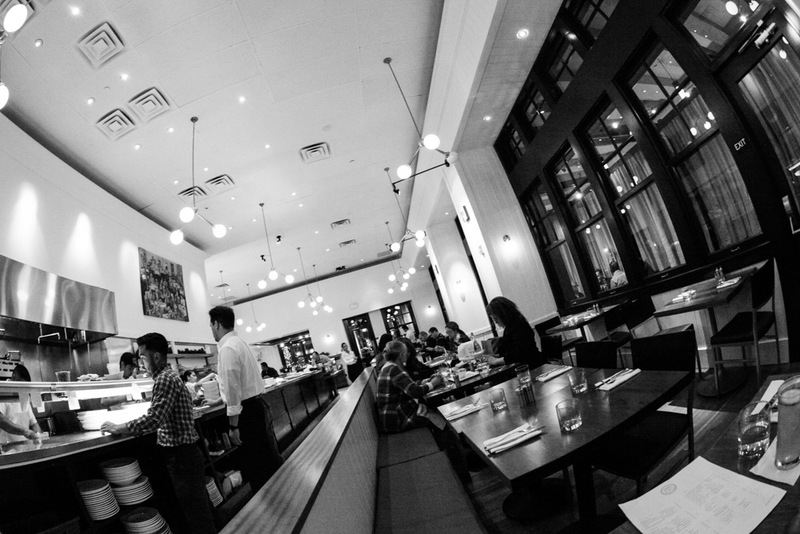 This is now easily one of the best restaurants on Santana Row. Ask your server for the chef's recommendations for that week and I don't think you'll be disappointed. 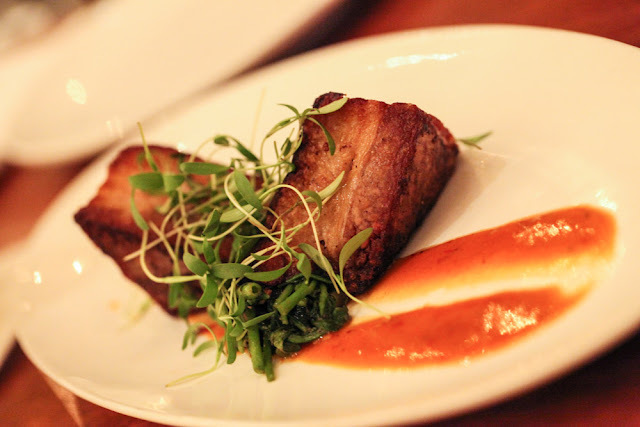 24 hour slow-cooked pork belly - This was both tender and crispy at the same time. It came with a flavorful side of morning glory (water spinach), a rare and hard-to-find topical plant used in Asian cooking but surprisingly hard to find in Silicon Valley. 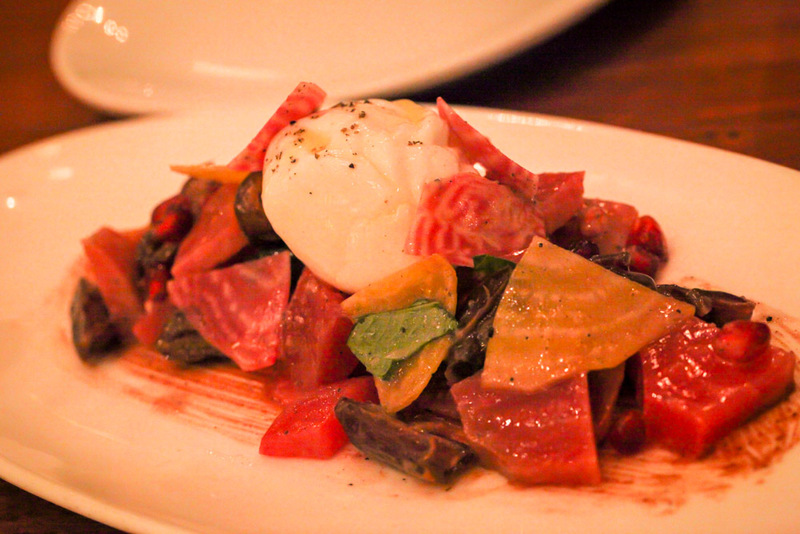 Heirloom beet and buratta - This is a must-try appetizer if you visit! The buratta cheese was smooth and creamy and was accompanied by beets, dates, and pomegranate. I could eat three of these and call it a day. Hamachi ceviche verde with avocado, kiwi, cucumber, green yuzu (Asian citrus) and plantain chips - Of all the great dishes we had, this one was my favorite. If you are a sushi fan like I am, you will love this. They use the fatty part of the hamachi (toro) for extra flavor. 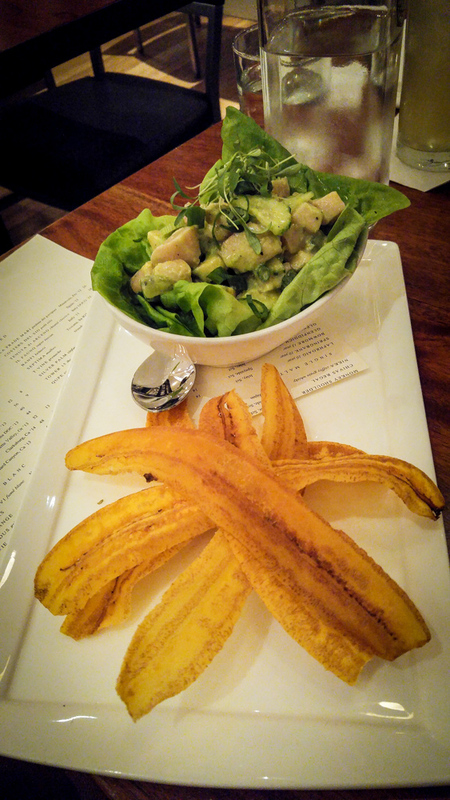 You can either use the plaintain chips to scoop up generous pieces of fish or use the lettuce on the bottom of the bowl to make a hamachi wrap (which I highly recommend, this helps you sop up all of the ceviche juices at the bottom). Yellowtail amberjack (cooked hamachi) with maitake mushroom, bacon, broken noodles, pickled cauliflower, and miso mustard glaze - Mind-blowingly good hamachi made from a dorsal fillet. A seaweed bacon infusion is used for the noodles. Braised local lamb cavatelli pasta with homemade lemon ricotta, grilled fennel, roasted tomato, olive, three herb pesto - Perfect for a hearty meal when it's cold outside. There were a lot of flavors on the plate and it was very filling. If you feel like skipping the appetizers and getting down to business, this is a great choice. 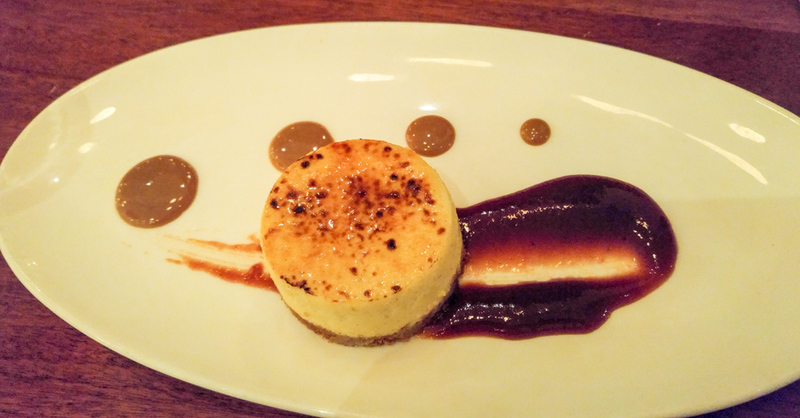 Cheesecake creme brulee, pink guava puree, cafe culce de leche - Very unique, I have never had a dish like this. This is a perfect hybrid of both cheesecake and creme brulee, two of my favorite deserts. I would order this again in a heartbeat. 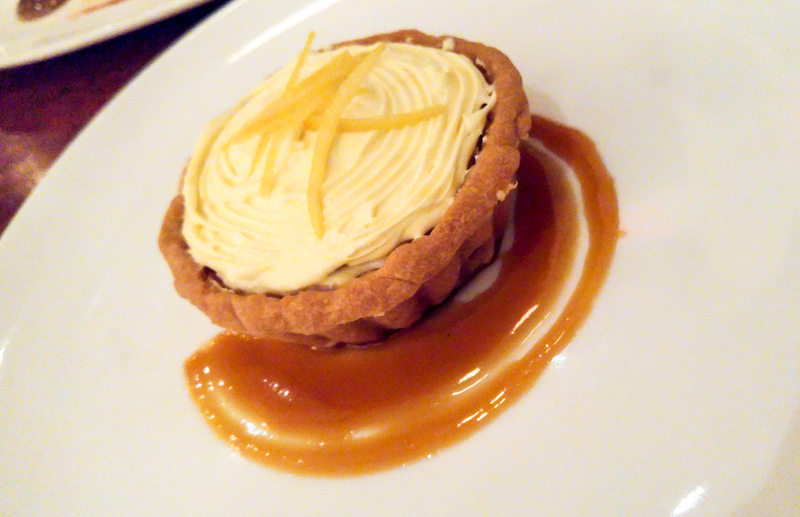 Caramelized pineapple and preserved lemon tart, white chocolate zabaglione (Italian custard made with egg yolks, sugar, and a sweet wine), pineapple caramel - This one was my wife's favorite. The flavors were very balanced and the cubes of pineapple inside of the custard were a great touch. Unfortunately the cocktails were not quite up to the same caliber as the food. A place like this really deserves some true craft cocktails to go with the killer dishes. I tried the Cucumber Mule (hanson's organic vodka, bitters, lime, and ginger beer) and Broken Branch (rittenhouse rye whisky, sweet vermouth, maraschino liqueur, amaro averna, bitters). They were fine, but I wouldn't come out of my way to grab a cocktail here. Wine might be a better choice with your meal. Chef Nick Tall also has ambitions to bring local craft beer vendors into the restaurant for multi-course beer pairings. He happens to be a brewer himself and has a strong appreciation and fondness for the art. If he launches a beer pairing for his outstanding menu, I'll be the first one in line. Thanks for the review. I will check it out this weekend! Yankee Pier and Lark Creek Blue were very mediocre, IMHO. A lot of times, it was not full. When it was kind of full, it appears to be patrons that were not able to get a seat in a decent amount of time at other 'row restaurants. That said, I'll still give this place a try, but I do not have high expectations.